Cocktail in hand, basking in the warm glow of the Caribbean sun as it disappeared into the sea, I couldn’t think of a place I’d rather be. High up on P&O Cruises’ flagship, Britannia, is The Sunset Bar. You would often find me here, tucked away from the stresses of life, completely embracing the Caribbean vibes. It was hard to believe that a week had passed since my early departure from Gatwick Airport. Yet here I was sipping a Long Island Iced Tea in tropical conditions without a care in the world. In the famous words of P&O Cruises: ‘This is the life’. My adventure? Sailing on Britannia as she finished her Caribbean season and travelled home across the Atlantic. Two years of planning, a number of family celebrations and an amazing itinerary all added to the anticipation we felt. It had been a long time coming, but here I was, finally cruising the Caribbean. It’s only fair to start with the aspect that truly made this cruise incredible – the itinerary. We spent twelve days sailing the Caribbean calling at six islands in total. 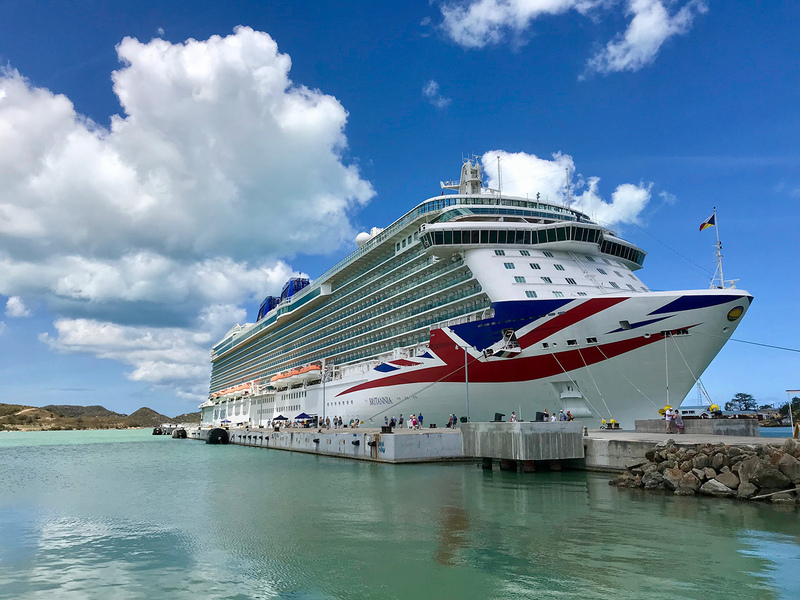 Embarking Britannia in St Lucia, famous for its lush valleys of coconut and banana plantations, the journey time from airport to ship was an hour and a half, accompanied by a local guide. From St Lucia we crossed to the ‘island of spice’, Grenada, one of my favourite ports of call. Here I explored how nutmeg, cinnamon and cocoa was produced before sampling the locally brewed spiced rum, which certainly had a kick! A stop at the immersive Annandale Falls within the heart of the rainforest followed, watching the water cascade down whilst witnessing sponsored jumps to help raise money for the local community – a picture perfect memory if I ever saw one. From Grenada we cruised the islands of St. Kitts, home to some of the best rainforest in the Caribbean, the French Territory of Martinique, the historic Antigua and, of course, Barbados, the Caribbean home of P&O Cruises. 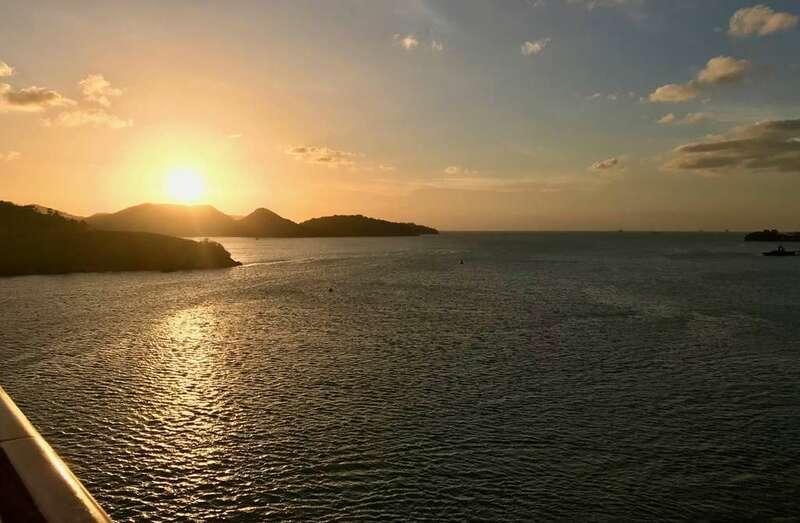 It is true what they say – no two Caribbean islands are alike – and each has something unique to offer: whether it is culture, history, activities or exports. If I had to choose my favourite, there is one that stands out, a favourite place of my late uncle’s, the gorgeous island of Antigua. Usually when you look forward to something this much there is always a risk it won’t live up to your expectations. But I needn’t have worried. The locals were friendly, the scenery incredible and the history intriguing, it’s truly a magnificent island and encompasses everything I love about the Caribbean. Antigua also happened to be our last port in the Caribbean. And though it was incredibly bittersweet, I was excited to start my transatlantic crossing, even if it meant leaving the Caribbean behind. Departing Antigua, eight sea days and a call in to the Azores separated us from Southampton. I love sea days and after a very port intensive itinerary, these provided ample time to recharge with plenty of opportunity to explore onboard. It had been two years since I last sailed on Britannia, so how was she fairing? There are signs of wear-and-tear, which you would expect, but the crew have maintained her well and there is no denying that she is still a stunning ship, radiating elegance and charm. Her public spaces are well-designed from a practical viewpoint and, despite her size, she has an ambience which remains intimate and inviting, with echoes of her smaller sister Aurora creeping through. Certainly, at no point did I ever feel overwhelmed by the number of passengers onboard, something I was grateful for. As for our accommodation, we plumped for neighbouring deluxe balcony cabins. Impressive and modern, almost minimalistic in decoration, they have the usual layout and amenities you would come to expect. The balconies are narrow making them difficult to use comfortably but remain perfect for enjoying a glass of bubbly or two whilst sailing into the sunset. Interestingly, there are no bedside lamps for reading, nor any coat hooks within the cabin. Minor issues, perhaps, but it seems strange that features which have been a staple part of cruise cabins for many years are missing. However, senior management did say these minor omissions should be addressed during her first refit in October 2019. Regardless, Britannia’s atrium is spectacular, with her starburst feature illuminating the surrounding decks. 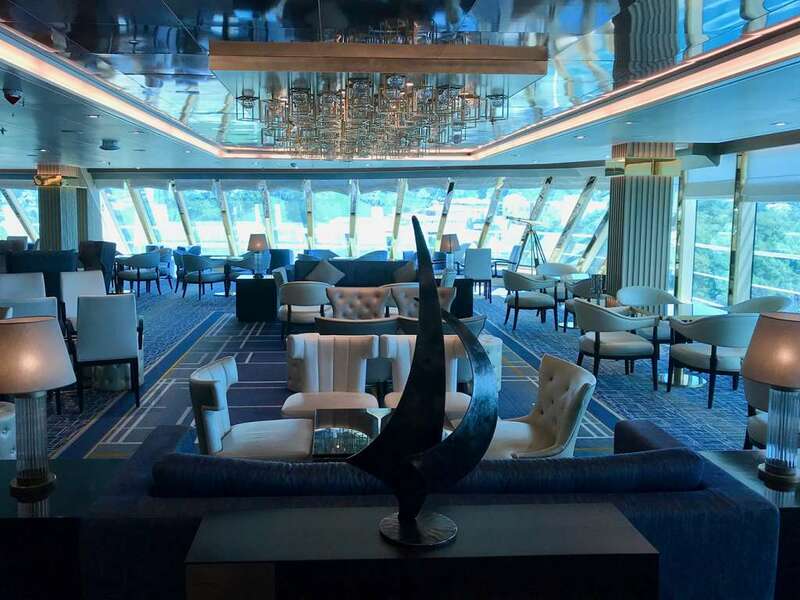 It is undoubtedly the social hub of the ship, with many choosing to enjoy a drink or a bite to eat here. Early on I developed an unexpected love with the Market Café, headed by celebrity chef, Eric Lanlard. On offer are crêpes and patisseries along with a selection of gourmet boards, all of which were delicious. In fact, a visit to the Atrium became a staple part of my daily routine, ensuring I received my much-needed afternoon tea and cake! 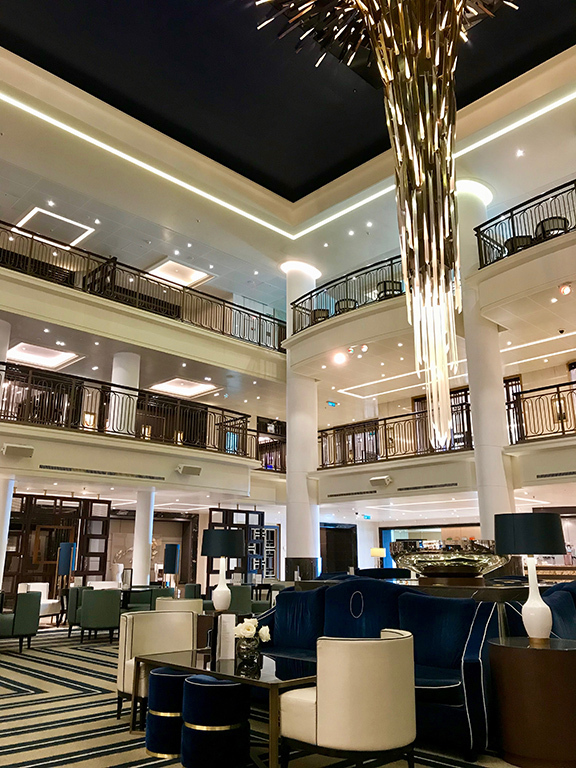 The Atrium’s glamour ripples throughout the rest of the ship’s numerous entertainment venues, bars and lounges – each having its own unique ambience and character. The Crow’s Nest was a favourite haunt of mine. A sophisticated feel with a nautical, yet modern theme, a spectacular view by day transforms to an evening of piano music and cocktails, or if like me, a journey through the rather large gin menu! Given the itinerary, I didn’t particularly use the evening entertainment. The Headliners Theatre Company are worth mentioning, leading some of the best shows I’ve seen onboard, all developed to suit Britannia’s hi-tech theatre and LED screens, creating shows which are a spectacle to witness. From productions celebrating the music of Queen to fairy tale stories with a touch of magic, there was something for everyone. Unfortunately, Britannia’s top deck signature light spectacular left much to be desired. This is where her age was showing. Many lights appeared to be malfunctioning and the production quality was lacking. Daytime entertainment was packed with activities, quizzes, events, movies, speakers, with more than enough to keep you occupied. As for me? I spent most of my time mesmerised by the sea, engrossed in a thrilling read or drinking a cocktail or two. Speciality dining was incredible. Britannia has six speciality venues, including my favourites, The Beach House and Sindhu, along with The Glass House, Epicurean and The Limelight Club. Each offers a varied menu with foods inspired from both home and away. We celebrated Mother’s Day in the finery of Epicurean, revelling in the culinary delights and flambé displays! The main dining room didn’t make the best first impression, with food being served cold on several occasions. However, this was addressed with apologies from the Restaurant Manager who re-seated us in the Peninsular restaurant. Here we met the star of the crew, Francisco, who certainly made our dining experience a fun one. Thereafter we dined in ‘Francisco’s corner’, making memories to last a lifetime. As the weather grew too cold to brave the outside bars, my last couple of day were spent looking through the ships windows at the ever-darkening sea. Savouring every moment of my final days on board, I had time to reflect on the incredible itinerary that I had witnessed and the memories I had made, eager to find my next adventure. Daniel Bradley is The Cruising Baker who writes about his two passions: cruising and baking! Check out his blog here to read more of his work.